I honestly don't think I've ever read another book like EYEM. There were many unique aspects of this book that set itself away from the contemp YA pack. In a nutshell, Evan is struggling with the loss of his friend Ariel, and to be honest, Ariel was more than a friend. Wasn't she? And to be even more honest, it took me a long time to figure out what the level of loss was. Is Ariel dead? Did she run away? What I do know is that Evan is is consumed with grief. I could use words like depression and despair to describe Evan's sorrow, but it almost isn't enough. Evan is literally lost and hopeless without Ariel. You will notice something different when you read this book. Well two things really.... One, there are pictures that coincide with the story. Evan finds photos that he thinks are left for him by someone who is/was close to Ariel. These pictures tease Evan - make him feel like maybe Ariel might have been hiding something from him. Evan thought that he knew everything about Ariel, but the pictures of Ariel in strange places suggest otherwise. Lucky for us, we get to see those pictures (my ARC was in black and white, but finished copy will be in full color). Two, a good portion of the writing is crossed out. These passages were almost the inner thoughts of Evan, the whispers in his head. I think this scratched-out writing may be a little confusing to those teens who are not fantastic readers. It took me a few pages to get into the grove of ignoring the superscript and to keep reading. Regardless, I don't think the book would have been the same heart wrenching story without the lines through text. 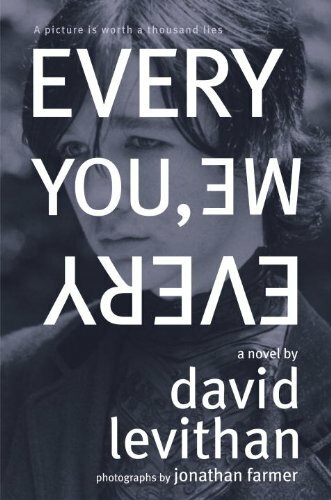 By the end of the first chapter, I thought I was spying on Evan and getting to know parts of him that maybe I shouldn't. Parts that were meant to be left out, but only I was privy to reading. We follow Evan as he continues on the mysterious picture trail and even further into depression as he alienates himself from everyone. As you can tell, this isn't a light and fluffy read. Levithan paints a vivid picture of grief, and just when you think Evan can't take anymore....hope and redemption peeks its head around the corner and we finally learn of what happened to Evan's beloved Ariel. EYEM is a heartfelt story about what it's like to loose a friend and yourself in the process. Fans will recognize Levithan's unique voice and appreciate the novel structure of this poignant story.